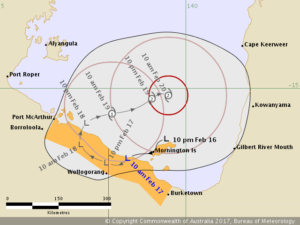 A category one cyclone has formed in the Gulf of Carpentaria but is due to weaken before heading towards the Northern Territory coast. The slow-moving low had been threatening to turn into a cyclone for days, and finally intensified into Cyclone Alfred about 7:00am. The Bureau of Meteorology (BOM) has warned there is high chance of a cyclone forming in Queensland’s Gulf of Carpenter this weekend. A tropical low moved from Gulf waters onto land during Friday morning, which saw the BOM downgrade its warning to a watch. The tropical low is expected to move back over water later on Saturday and there is a more than 50 per cent chance it will develop into a tropical cyclone on Sunday. It is possible the system may reach category two intensity if it remains over water. “It would be the first cyclone of the season,” BOM forecaster Janine Yusa said. If the cyclone develops it will be called Alfred.